In last year’s newsletter, we offered a discussion we had with Changling Rinpoche that focused on the Tibetan terms “rangshin” and “tröpa.” One year later, here is our discussion with Rinpoche concerning the term “nang-si”(Tib. snang srid), which we usually translate as “phenomenal world.” Rinpoche constantly challenges us to examine why we pick particular words in translation and to consider how the language of our translations will be understood by the general Western reader. Sometimes, this requires unpacking the philosophical implications (at times rather esoteric) of the terms we use. The following exchange took place at a meeting in Halifax, as we were beginning to look at the first stanza of “The Melody That Accomplishes Deathlessness,” which is a general longevity supplication. 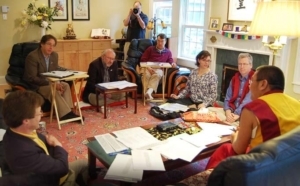 In addition to Changling Rinpoche (CR), members at the meeting included Patricia Kirigin (PK), Scott Wellenbach (SW), Mark Nowakowski (MN), Dorje Loppön Lodrö Dorje (LD), Larry Mermelstein (LM), and Tingdzin Ötro (TO). You ripen and free our three gates into vajra nature. Vajra monarchs, may you ever remain. CR: First, I have a question for you. In the first line, what word did you use for nang-si? PK: Because nang means “appearing,” we might say “appearing existence” or “apparent existence.” Traditionally we have said “phenomenal world.” In English, that means everything that is perceivable. SW: Rinpoche, we have received two different interpretations. In one interpretation,nang-si altogether means “phenomenal world” or “apparent existence.” In the other,nangwa (snang ba) and sipa (srid pa) are like nö (snod) and chü (bcud), the environment and its inhabitants. But we’re not always sure which one to use, so we thought that “phenomenal world” might be a little more general here. MN: Trungpa Rinpoche used “phenomenal world.” For example, with him we sometimes translated nang-si silnön (snang srid zil gnon), one of Padmasambhava’s manifestations, as “subjugator of the phenomenal world.” Some translators use “all that appears and exists” for nang-si, but we usually don’t. LD: Now that you’ve raised the question, it is a strange phrase. It’s very abstract. LM: Rinpoche is very good at raising such questions. CR: What does “phenomenal world” mean in English? LM: It means anything in the world that can be perceived by the senses. In more ordinary English, we would just say “the world,” which is more direct and simple. PK: I think people usually use it in connection with having an experience of the five senses. SW: The word “phenomenon” comes from the Greek verb “to appear” (phainesthai). It refers to how something appears, as opposed to what it actually is. LD: It is a philosophical term. 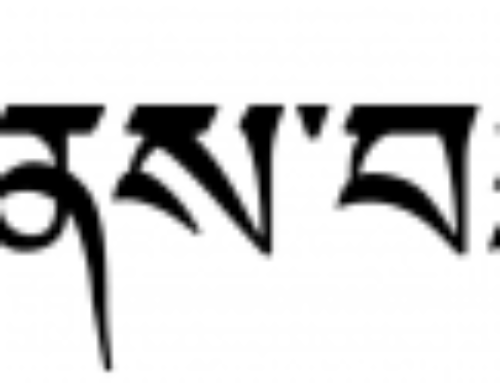 CR: In Tibetan, nang-si is short for nang shing sipa (snang zhing srid pa). SW: Yes. That came from the Vidyadhara. TO: Would a mirage, such as water that you see in the desert, be a nang-si? It appears, but it does not exist. CR: From the perspective of the people who see the mirage, or of those who do not see it? LM: The people who see the mirage are seeing something. CR: There are two types of kundzop (“relative truth”): correct kundzop and mistakenkundzop. There are two different explanations of mistaken kundzop. The first distinguishes between phenomena that have an effect and phenomena that do not have an effect. The other explanation, by Chandrakirti, compares a form to correct kundzopand its reflection to mistaken kundzop. PK: Would both of those be nang-si? CR: Yes, nang-si includes all kundzop. If it is kundzop, it is a phenomenon. Now, what is not nang-si? For example, the horns of a rabbit. Both correct and mistaken kundzop are regarded as sheja (shes bya), or knowable objects. But the horns of a rabbit are not even mistaken kundzop. SW: They are not even a phenomenon. CR: As another example, dendrup (bden grub; “true existence”) is not even a mistaken kundzop; it is not a knowable. Therefore, a mirage is mistaken kundzop. It is a false appearance, but it is nang- si because it is an object that appears to the mind. LM: For a mirage, you think you see water. Later, you find out that it was not water, but it was still an appearing object to you. TO: Can nang-si also refer to things that we cannot see, such as beings in the preta realm? LM: So it includes all of the six realms? TO: Is töndam (don dam; “absolute truth”) also nang-si? CR: That is a subject of debate. It depends on whether or not you consider absolute truth to be a knowable. If it is a knowable, then it is nang-si. But if it is not a knowable, it is notnang-si. PK: So, all knowables are nang-si? LM: So, what do you think of saying “phenomenal world” for nang-si? Does that seem strange to you? CR: No. I just wanted to be sure that you had a valid reason for using it. MN: It’s a shorthand expression. Nang means that it appears, and si is the world. “All that appears and exists” would be a much more literal translation. Saying “apparent existence” has its problems. It seems to imply that there is “unapparent existence,” something that exists but you cannot see clearly. SW: You said that nang-si is short for nang shing si-pe chö (snang zhing srid pa’i chos). We know the words, but could you explain what they mean? SW: Is there a difference between what is nangwa (appearing) and what is sipa (existing)? CR: Actually, whatever is nangwa is also sipa. There are many ways of explaining nang-si. Sometimes, nangwa refers to the world, and sipa refers to sentient beings. Sometimes,sipa refers to samsara, and nangwa refers to nirvana. Sometimes, nang-si refers to both samsara and nirvana; at other times, it refers only to samsara. So it really depends on the context. In the first line of the verse we are discussing, the nang in nang-si refers to the world and si refers to phenomena. [laughter]. I only wanted to ask why you used it. SW: We had no idea—but now we do [laughter].